The National Confectioners Association notes trends in confectionery and snacks for 2012 are pushing new boundaries. "Trends in confectionery and snacks for 2012 are pushing new boundaries," says Larry Graham, president of the Washington, D.C.-based National Confectioners Association. "As consumer palates become more complex, flavor profiles across the industry are doing the same. 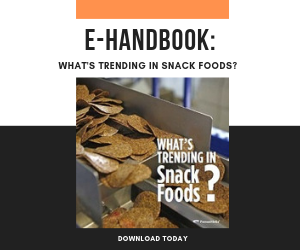 People are looking beyond borders and convention for what's next; whether is crunchy snacks with Asian or Mediterranean influences, the growing popularity of all things salty and sweet, or tropical fruit flavors such as mango." "The sweet and snack food market makes $80 billion a year in sales, accounting for about 10 percent of total store sales in the U.S. and $357 billion a year worldwide," says Susan Whiteside, association vice president of communications. Roughly 30 percent of annual sales can be attributed to products that came out within the last two years, she said. Last year alone, 4,600 products launched and nearly half made their mass debut at the expo. In 2011, 1,563 new confectionery products debuted, according to Datamonitor's Product Launch Analytics online database of new U.S. products SKUs 2011. There were 895 Chocolate rollouts, 512 Sugar Confectionery (non-chocolate) treats, and 156 Gum products to chew on. On the snack front, 3,231 products were launched. Cookies accounted for 634, crackers (287), potato chips (382), popcorn (114), nuts and seeds (461), cereal bars (357), other savory snacks (pretzels, tortilla chips, puffed snacks, fruit snacks, meat snacks, etc.) totaled 844, and processed snacks (tortilla chips, corn chips, other non-potato chips) came in at 152. Packing a Healthy Punch – Healthy snacking continutes to gain momentum this year. Nutritional health bars are the top growing snack item, according to Symphony IRI (52 weeks ending, March 18, 2012). Many new snacks provide a variety of health attributes, whether gluten-free, all natural, made from whole grains, or including B vitamins and antioxidants, there's no doubt consumers can find a snack packing the healthy punch they want.